When it comes to your kitchen, your stove sees the most action. No matter how hard you try, drips, spills, and boil overs are going to happen even if you wipe down your glass top stove, drip pans, and burners every day, that is still not enough. Most ovens end up looking grimy and stained by the end of the week and require a good cleaning using a homemade stove cleaner. If you even glance at your stove, you can easily spot the burners that get the most use based on their grime level. The cleanest looking drip pan and burner is the one that gets used the least, so it will also be the easiest to clean. Some people prefer to start cleaning with a natural stove cleaner while doing their dishes after dinner. Others prefer to tackle the chore first thing in the morning. There is no wrong time to clean your oven, but some DIY stove cleaner recipes require you to soak the dirtier parts overnight for an easier clean. There are plenty of natural stove cleaner recipes you can use for caked on grime, but some of the best natural cleaners for stove tops require no recipe. 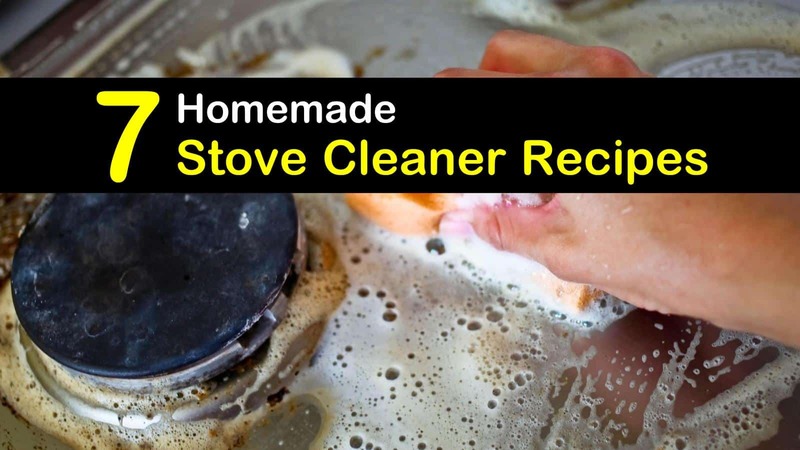 Baking soda, dish detergent, lemon juice, and white vinegar can all be used to clean your stove top. These ingredients also happen to be the best way to clean a dishwasher, too. When using water, vinegar, or other liquid to clean your stove top, never soak gas igniters or electrical connections. You can safely soak your grates and drip pans in any cleaning solution, but the igniters and electrical connections are fragile. Soaking these components can lead to corroded connections or other damage. Liquids should never be sprayed on these components either. Always spray stove cleaners on a soft rag and wipe around the elements. Cutting through grease and grime is a regular occurrence for stove tops. All recipes are going to require a little elbow grease along with a powerful cleaner. Mix washing and baking soda in a shaker container. To use, sprinkle the powder over the stove top and scrub with a damp non-abrasive sponge. Use a second clean, wet cloth to rinse away any leftover residue. Grab a glass jar and some citrus peels. What ones you choose will depend on the scent you prefer. Pack citrus peels tightly into a glass jar, pour in white vinegar until full. Allow peels too steep for two weeks. Pour the solution through a strainer. Mix equal parts citrus infused vinegar and water inside a spray bottle. Store remaining citrus vinegar in a glass jar until needed. Spray directly onto the stove top and wipe with a clean, damp sponge. A glass stove top might look pretty, but keeping it clean is quite a chore. No matter how much you wipe down your glass top stove, those drips and stains are going to show. This all-purpose cleaner is safe for all stove tops and oven glass. The recipe can be adjusted based on the size of the area you are cleaning. Mix the three ingredients and apply to the glass stove top using a damp cloth. Scrub the cooked on food and rinse clean with a second wet towel. One of the most common sights on a glass stove top is burnt on food. With really burnt on food it seems elbow grease isn’t enough to cut through it. For stubborn stains, use a razor blade to scrape the food away gently. In a large container mix all ingredients. Soak the rag in the cleaning solution and wring out gently. The cloth shouldn’t be dripping but needs to be wet. Spread rag over burnt on food; you can use several cloths if required. Allow rags to sit on the stove top for 30 minutes. Wipe gas stove top clean and repeat if any food remains. Sticky messes happen on all stove tops, the key is cleaning them before they become burnt on messes. A simple paste of liquid dish soap and baking soda should do the trick. Mix dish soap and baking soda into a paste. A few drops of water might also be necessary to create the right consistency. Dip a paper towel into the paste and rub in circles on your electric stove top. Rinse with a clean cloth. Black stove tops are hard to clean as they show every little thing. To clean a black stove top start by wiping it down with a wet paper towel. Next dip a nylon scrub pad in some hot water mixed with grease-cutting dish detergent, such as Dawn. Scrub the stove top, rinsing the sponge in the soapy water as needed. Once all grime is gone use a clean sponge to wipe the stove top clean. Buff dry with a lint-free cloth. Harsh chemicals are not necessary to cut through even the worst build up on your stove top. Baking soda and half a lemon can easily do the job with their natural grease-cutting and antibacterial properties. Just sprinkle the cooking surface with baking soda and scrub with a lemon cut in half. Wipe up any residue with a clean sponge. Thank you for taking the time to read these stove top cleaning tips. 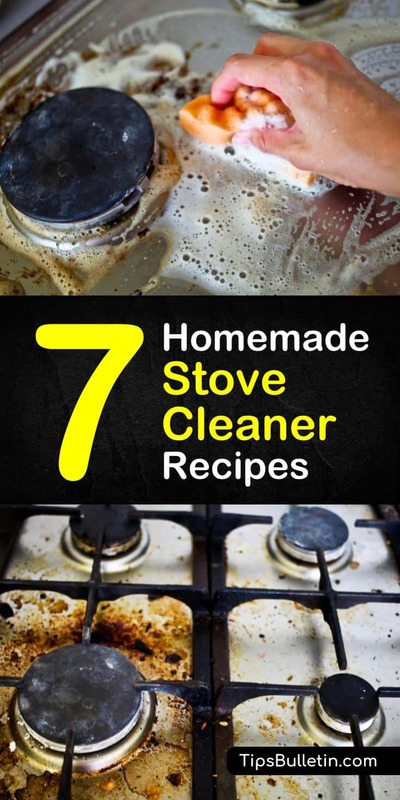 If you have found any of these oven cleaner ideas helpful, please take a minute to share our homemade stove cleaner ideas on Facebook and Pinterest.